England manager Gareth Southgate: "I thought Raheem was electric all night. He has looked like that all week in training.I'm pleased for him, it is a special night for him. Former England midfielder Joe Cole: "His development is going through the roof and his decision-making is getting better and better. He's turning himself into a midfielder with a striker's mindset. It's a great achievement to score a hat-trick for England." Ex-England striker Ian Wright:"Raheem has brought his Man City form into his England play. The fans know what he's been through so of course they're going to get behind him. "Pep tells him to get into those areas and you saw his determination to get into the box." Former England defender Lee Dixon:"Pep has given Raheem that belief in his own ability. We've all criticised his finishing at times but now he has that confidence." Ex-England winger Chris Waddle: "Expectations have always been high on Raheem Sterling. Would he go on and be the player England hoped he would be? He is now getting better and is playing in a team full of confidence - whether it is Manchester City or England." Right then, it is time for me to say goodbye. At the start we dreamed about England playing the Euro 2020 final on home soil at Wembley. A few more performances like that, albeit against much better opposition, and you could not rule it out. Recap a wonderful night for Gareth Southgate's side by reading Phil McNulty's match report. And I'll leave you with a recap of the praise dished out to England's hat-trick hero Raheem Sterling... Night! Ooh la la! England aren't the only Euro 2020 hopeful setting out their stall tonight with a thumping win. France, the world champions no less, whacked hosts Moldova 4-1 after goals from Antoine Griezmann, Raphael Varane, Olivier Giroud and Kylian Mbappe. Portugal might have had Cristiano Ronaldo back among the troops, but even he could not help break down a stubborn Ukraine side in a 0-0 draw. Elsewhere in England's Group A, Montenegro drew 1-1 at Bulgaria while in Group B Luxembourg earned a rare win by beating Lithuania. And, in France's Group H, Turkey and Iceland recorded 2-0 away wins at Albania and Andorra respectively. Three former England players have been reacting to Raheem Sterling's hat-trick in the ITV studio. Joe Cole: "His development is going through the roof and his decision-making is getting better and better. He's turning himself into a midfielder with a striker's mindset. It's a great achievement to score a hat-trick for England." Ian Wright: "Raheem has brought his Man City form into his England play. The fans know what he's been through so of course they're going to get behind him. Lee Dixon: "Pep has given Raheem that belief in his own ability. We've all criticised his finishing at times but now he has that confidence." England manager Gareth Southgate, speaking to ITV Sport: "I thought Raheem was electric all night. He has looked like that all week in training.I'm pleased for him, it is a special night for him." On England's 4-3-3 system tonight: "We've got exciting wide players, we saw the two young boys (Jadon Sancho and Callum Hudson-Odoi) as well, so it gets our good offensive players on the field and higher up the field." On what has clicked for Sterling: "I think he's really matured as a person and a footballer. He's hungry for goals and hitting things instinctively without thinking too much." Expectations have always been high on Raheem Sterling. Would he go on and be the player England hoped he would be? He is now getting better and is playing in a team full of confidence - whether it is Manchester City or England. Gareth Southgate's first word on Raheem Sterling? "Brilliant." England hat-trick scorer Raheem Sterling, speaking to ITV: "It was a beautiful team performance and I was happy to help the team get the win. I'm just being confident in myself, I'm trying to get in areas and take shots, not to worry about anything. The first goal pleased me most, to get myself up and running." On his tribute to Damary Dawkins, a Crystal Palace youth-team player who died from leukaemia on Sunday: "Damary was a kid I was trying to help and we thought we'd found a donor. Sadly it didn't match and sadly he passed away, so I wanted to give his family something to smile about." Iain Moss: Used to loathe international breaks but not any more! Confident, professional performance from England with the flash of swagger at times! Saqub Sheikh: Impressive England performance tonight. 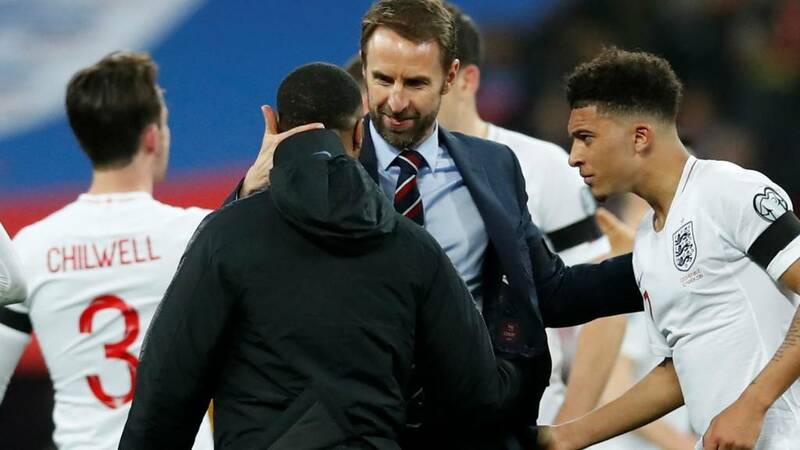 Credit to Gareth Southgate for creating a positive team dynamic. We have players who are playing with the 'handbrake' off and are exciting to watch. Josh Earl: Credit where it's due, we've made an albeit not great side look a lot poorer than they actually are, as we often do in qualifying. European champions Portugal are on the verge of drawing with Ukraine at home. The qualifiers are only as easy as you make them. Raheem Sterling - player of the year? Discuss. England skipper Harry Kane, speaking to ITV: "Our system tonight definitely suits Raheem - 4-3-3, the wingers staying high. "It was a brilliant team performance, we pressed, we made it difficult for them, got the goals and were clinical. "We're enjoying it out there, we're a confident team coming off back last summer and the Nations League. England have a lot of players who are comfortable with the ball. When we were relying on Raheem Sterling to do that, we now have three or four and it frees space up for Sterling. He pops up in gaps. He is in a team where the movement is good and there is confidence. We don't have to just rely on him and he is getting the benefits of it. No coming back from this for Argentina now. Atlanta United striker Josef Martinez, who has scored 59 goals in 67 games for the MLS Cup winners, has grabbed a third from the penalty spot for Venezuela. Five alive! England have bagged five times at Wembley for the first time since October 2014. Remember that one? A 5-0 v San Marino in Euro 2016 qualifying. It was a very good performance by England. They were far better than the Czech Republic and it showed tonight. England were absolutely too good for them. Raheem Sterling will get all the headlines for his hat-trick but I thought Jordan Henderson had a very, very good game.